A friend of mine called me the other day after he finished lunch at a pizzeria he's been eating at for years. "You are not going to believe what just happened," he said. I could tell from his tone that it was not going to be a happy tale. He had ordered a flatbread appetizer for lunch, and when he went to use his loyalty stamp card at the end of the meal, his server told him that she could not mark it because he did not specifically order a lunch special. He asked to see a manager and the manager told him the same thing--in order to get a stamp on his lunch loyalty card, he had to order a lunch special, which was $1 more than what he ordered. My friend pointed out to the manager that it did not state on the card anything specific about having to order a lunch special, but the manager stuck to his guns and would not stamp the card. My friend told the manager that he was disappointed in the handling of the situation and would not be returning to the establishment. My question to you is, how important is winning an argument with a customer? If you, or someone on your staff, has found yourself in this situation, is it worth losing a loyal customer, and possibly several of their friends when they spread the word about their experience? Consider this...after my friend left the pizzeria, he immediately called me to relay the story, posted a message on Facebook letting all of his 1,500+ friends know what happened, and contacted the corporate office. All of that bad press for the pizzeria could have been avoided if the manager would have stamped his loyalty card. Far too often I've witnessed owners and managers arguing with customers, whether it's about prices, food quality or taste. What happened to "the customer is always right?" One of the newer entries into the micro-greens category are herb and flower crystals. They're being used in both culinary and cocktail creations, and have been spotted in varieties ranging from basil to mint to fennel. When I saw them on the show floor at the NRA show in Chicago, I wasn't sure what to make of them, but they do pack a lot of flavor into a tiny little crystal. They're interesting to experiment with if you're looking to try something new. I like the idea of using them with cocktails (mint-rimmed mojitos and basil-rimmed bloody mary's come to mind). 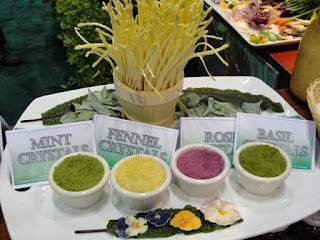 However, I can see how the fennel or basil could also be integrated into small appetizers for a bit of wow factor. Have you tried these or do they intrigue you? What would you use them for? I've heard several people refer to the social photo sharing site Pinterest as "girly." And in fact, statistics show that about 80% of the site's users are female. Over the past year or so, several anti-girly versions of the site have cropped up; one is called Manteresting, which uses "nails" instead of "pins" to share photos. The design of the site has a masculine feel, photos lean more toward cars and women (there are strict rules against posting inappropriate photos) and less toward cupcakes and wedding dresses. Other similar sites include Dudepins, Dart It Up, Gentlemint, and Tapiture. What's your take? Would you prefer to post to Pinterest, a "manly" board, or do you not have a preference either way? Whenever I see something cool, I always think about how it can translate to a pizzeria. Last weekend, while at the National Restaurant Association Show in Chicago, a Star of the Bar contest was held within the International Wine, Spirits & Beer Event (IWSB). Six mixologists prepared samples of their cutting-edge cocktail creations for attendees to sample. 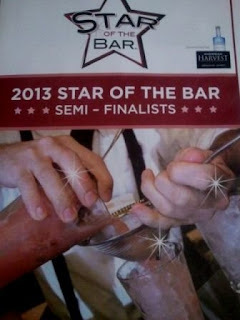 In return, everyone voted for their favorites by placing a card in a bowl marked with each mixologist's name at a judging station. I thought this could be a really fun event for a pizzeria to hold on a typically slow night. 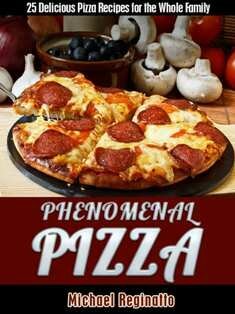 Each pizza chef/cook could create their own unique pizza combination, customers could sample each, and vote. A modest admission price could be charged (and even donated to charity if you're feeling generous). This type of event is a great way to build a sense of community, test out new recipes, help your staff feel more connected to your customers, and garner easy press for the pizzeria. The buzz is sure to spread on social media before, and long after, the event. What ideas have you seen lately? Always be on the lookout for marketing tactics that may not scream "pizza," but can easily be transformed into something you can use in your own business. 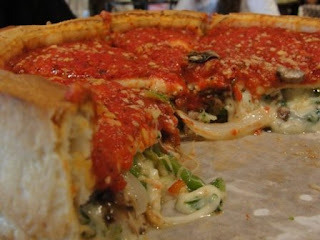 Veggie stuffed pizza at Giordano's Chicago. There is never a lack of great food when in Chicago for the National Restaurant Association show each year. This year I'm sharing a few favorite menu picks from various restaurants, including the veggie stuffed pizza from Giordano's you see at the left. Our waitress told us three times that it would take 40 minutes for our pizza to be ready, and three times we replied that we were perfectly fine with 40 minutes. All good things come to those who wait. 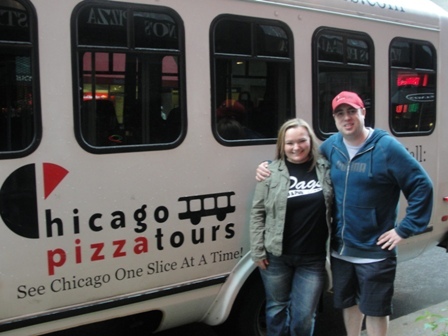 PMQ's senior copy editor Tracy Morin and I will be including more information about our Chicago pizza stops in the Pizza Press section of PMQ's August issue, but in the meantime, I hope the below items will get your creative juices flowing. Here's an appetizer from Siena Tavern -- burrata with eggplant caponata, aged balsamic and pecorino oil. The cheese was creamy and salty, perfect with the eggplant and crispy bread it was served with. Utilizing house-milled Midwestern wheat, this tagliatelle pasta from Nellcote featured Illinois ramp pesto, snow peas, pecorino romano and marcona almonds. The combination was earthy and fresh. I love a good bruschetta. This unique offering from Balena combined spring peas, ricotta, green garlic and pea shoots for a true taste of springtime. I'm a sucker for a good cookie, especially one that's cooked in a skillet, which is exactly what I spotted when we sat down at historic Aurelio's Pizza in Homewood. The gooey chocolate chip cookie topped with vanilla ice cream, whipped cream and chocolate chips was the perfect finish to a lunch of salad, pizza, meatball sub and calabrese. I always know where to find pizza on the show floor at NRA. 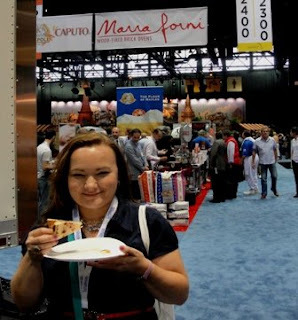 Yesterday was the second day of the four-day National Restaurant Association Show, and after two days of perusing more than 2,000 booths, some clear trends became evident. I'll cover each trend in more depth in future blogs. The number of gluten-free and allergy related products this year is staggering. I remember when we used to search for a handful of gluten-free products on the show floor; this year is a Celiac's dream come true. If you've been considering adding flatbreads to the menu, I saw a countless number of companies offering the ready made variety. Sustainable products are a big focus at the show, and several companies have microgreens on display. There's even a hydroponic garden on the show floor so that attendees can watch how the plants grow. Probably the best, and most promising, trend I've seen is a growing restaurant industry, evidenced by the fact that NRA show organizers reopened another hall to accommodate 400 more exhibitors--something they haven't done since 2008. Are you feeling a surge of growth in the industry? How is it affecting your pizzeria? Let us know in the comments section. Last year, with Jon Porter, who runs Chicago Pizza Tours. The National Restaurant Association (NRA) show starts tomorrow in Chicago, and PMQ will be there! It's my favorite food show of the year. Not only because hundreds of new products are making their debut, dozens of educational sessions will be taking place, and tons of industry friends will be walking the show floor, but also because I love Chicago! I love it so much that I don't even care that I had to wake up before 3:00 a.m. to make a 6:05 a.m. flight this morning. I can sleep when I get back home! In addition to scoping out the latest and greatest products in foodservice, and discovering what's new in online ordering for an upcoming PMQ article, I've already made a list of pizzerias that myself and fellow PMQ editor Tracy Morin will be fitting into our schedule. While pizza plans have been known to change at the mere sighting of an oven through a pizzeria window, the spots we've slated for pizza so far include: Siena Tavern, Pizzeria Serio, Aurelio's Pizzeria, Balena, Giordano's, and Nellcote. If you're a Chicago native, or know of a new Chicago pizzeria we need to add to the list, let us know in the comments section below. Stay tuned for photos! It's never been easier to create and send e-newsletters to your customers. This means customers are probably receiving several other newsletters as well. So how do you stand out from the pack and ensure that your newsletter gets read? Follow these three simple steps to keep your newsletter from facing the dreaded delete button. Stick to a Simple Format. Choose a format that's easy to create and compose regularly. A standard newsletter contains around three short stories. Most people don't have the attention span for much more than that. Besides, you want to make the newsletter easy enough to allow you to meet your deadline each week/month. Engage Readers with Interesting Stories. Your newsletter shouldn't just be about your newest menu items. Grab their attention with something they may want to share with friends or family. Think about stories you would enjoy reading and take inspiration from there. It could be a fun photo from the past or a mystery that customers have to solve each week. Be creative in getting them to open your email. Keep it Conversational. 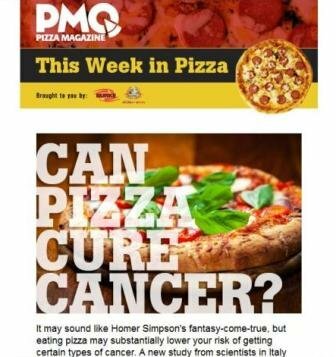 E-newsletters should feel like a personal note from the pizzeria, so keep it casual and friendly when talking about news about the company and latest happenings. The more your customers feel like a friend, the more likely they will be to look forward to your emails. For a bit more insight, I went to The Pizza Insider Blog Advisory Board and asked their opinions on the marketability of e-newsletters. Are you sending out an e-newsletter to your customers? How do you keep it relevant and interesting? Let us know in the comments. When you own or manage a pizzeria, it's difficult to take time out for yourself. But when you have so many people depending on you, and many times a family at home as well, it's important to keep an eye on your health and well being. Grabbing a slice and soda at the store and working through the day with no breaks can wreak havoc on your body. Take note of some of the steps below to bring more balance to your life. Watch What You Eat. Make a conscious effort to rid your home pantry of products that contain excessive levels of fat, sugar and salt. Stock up on whole grains, lean proteins and lots of fruits and vegetables. Get in the habit of checking labels when you shop, and sit down and enjoy your food without outside distractions. Drink Up. First and foremost, your beverage of choice should be water--and plenty of it. Not only is it the most pure form of hydration, but it also helps to keep skin hydrated and your body in working order. If you crave flavored beverages, seek out unsweetened ones, such as teas. Move Your Body. It’s important to fit some movement into your daily routine. This may mean parking farther away from the store, taking the stairs instead of the elevator, going for a walk after dinner, doing mini exercises during commercials, etc. No matter where you are, there’s always time to fit in some form of exercise. You will quickly feel the benefits with increased energy and more alertness. Take Time to Relax. 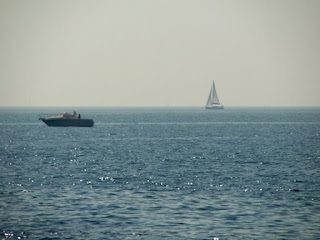 For the same reasons you need to exercise your body, you also need to relax it. We’re all under immense levels of stress on a daily basis. Without a few moments to ourselves to decompress and relax, we may snap at loved ones or staff as a release of our stress. Take time out of your week to read a book, meditate, take a walk, phone a friend, or enjoy a glass of wine on the patio. Find Balance. It can be hard to find balance when so many bring work home with them on their cell phones nowadays. But if you’re serious about balancing your home and work life, slowly work toward giving yourself time off from work when you're home. Spend the time away from the pizzeria with your family and friends. Say no to the things that don’t add value to your life, and treat yourself to things that give you pleasure more often. Explore the world, your relationships, and your interests. 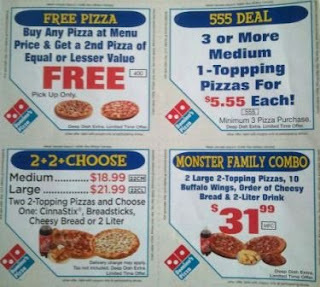 When it comes to coupons in the pizza industry, opinions run rampant. Some are in favor of them as business boosters, while others argue that they can only hurt business. The main idea is for your coupon campaign to promote your business and get people talking. Many people--myself included--may see the coupon, be reminded of you, and order without even using the coupon! As for which couponing strategies work best, no one seems to know the answer to that one. You could ask 100 pizzeria operators and they'd all give a different answer. I have often heard that offering something for free is usually very successful (free breadsticks, free soda, etc.). Everyone loves to get something for free, and these items generally cost you very little to give away. The one big requirement of couponing is that you must track what happens with the coupons. If you aren't monitoring how they are being redeemed, you'll never know if the campaign is beneficial or not. 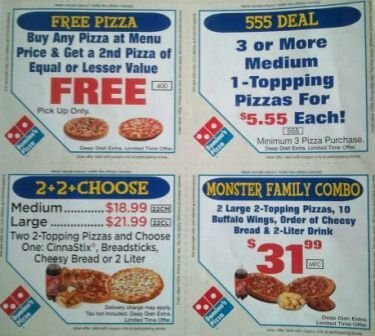 I wondered what The Pizza Insider Blog Advisory Board members thought about couponing in pizzerias, so I asked for some of their opinions. I very rarely drink soda, so when I go out to eat, I always order iced tea. Here in the south, I order "unsweet tea" since the average sweet tea recipe can contain anywhere from 1/2 cup to two cups of sugar per gallon. There was a time when tea was an afterthought on many restaurant menus, but statistics now show that it appears on nearly 75% of all menus, according to research firm Datassential's MenuTrends platform. And, we can't ignore the purchase of the 300-unit Teavana chain by Starbucks back in November of last year. Tea is definitely getting its moment in the spotlight. 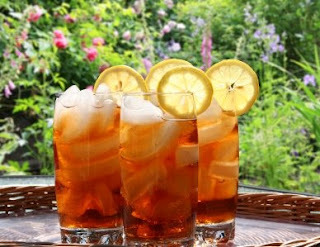 Iced tea offers consumers a healthy beverage choice, and is easily transformed with flavor mix-ins. Some of the most popular flavors of iced tea include raspberry, strawberry, green tea, peach, lemon and mango. I've even seen some restaurants stir in syrups normally used for coffee or cocktails. In fact, a quick visit to the Torani site returns more than 100 recipes for teas that integrate blueberry, coconut, cherry, apple, huckleberry, lavender, watermelon and more. The Monin site shares a regularly updated list of the top 10 most popular flavorings for iced tea, which include blackberry, pomegranate and wildberry. Are you doing something unique with your iced teas? Let us know about it in the comments section. Have you ever thought about writing your own pizza book? Maybe you're sitting on a gold mine of recipes you'd like to share with consumers, or perhaps it's marketing and business tips that you want to give to fellow pizzeria operators. Whatever the topic may be, it's gotten easier and easier over the years to self-publish your own books and e-books. In the past, you'd have to print hundreds of copies and risk having leftovers stacked in the garage. Nowadays, you can print on demand or offer e-books and Kindle versions that readers can download right onto their computers and reading devices. There are many self-publishing companies; some of the more popular ones include Lulu, CreateSpace, Blurb, Booktango, Dog Ear Publishing and Xlibris. However, before diving into any book project--online or print--plan for some of the basic costs, and consider your marketing. Costs: There are the basic costs that accompany printing and royalties. But before those, consider the cost to develop the book--photography, editing, etc. If the book doesn't look good, or if it's filled with errors, sales will struggle and you risk hurting your reputation. Marketing: Plan your marketing attack before you even start writing the book. Will you use it to grow your customer base or build your status as an expert in the industry? What's your goal with the book? This will directly affect your marketing plan, which should include free copies to media/select customers, promotion on social media, your website and more. Time: You're probably thinking that you don't have a lot of extra time on your hands to write a book. If you need help, there are ghostwriters who can help put your words on paper. Sites like Elance have thousands of freelancers at the ready. The Payoff: First of all, how cool would it be to tell people you've published a book? Beyond the cool factor, your book can act as your new business card at speaking events, networking mixers, gifts at the pizzeria and more. You will instantly gain more credibility and others will seek you out for advice. So what would you write about if you took the publishing leap? Have you already published your own book? Let us know in the comments section. It's debate season here in Oxford, Mississippi. I attended an event last night introducing the Mayoral candidates and those running for Alderman. I've run for Alderman myself here in Oxford, but that's a story for another day. Following the debate, I started thinking about all of the political yard signs, campaign social media sites, door-to-door visits from candidates, and direct mail pieces that are sent out before election day. It made me wonder how many pizzerias, if any, have run a pizza campaign similar to a political campaign. Depending on your budget, a campaign like this could follow all of the standard political campaign steps and garner a lot of attention for your pizzeria. 1. Organize Your Team. Choose a "campaign manager". You'll need help with social media, signage, a door-to-door game plan, etc. 2. Create a Press Release for Local and Surrounding Media. The great thing about this kind of promotional campaign is that you'll be the only one running in the race, and the media will probably find a pizza campaign pretty unique. 3. Create an Online Page. Whether it's on social media or a part of your pizzeria's website, you'll want an online home for the pizzeria campaign where people can come and see what it's all about and follow what's happening. 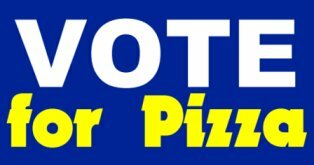 Remember, this is a campaign where pizza wins, and that pizza just happens to be at your pizzeria. Gather "votes" for pizza (this is a great way to collect information for marketing purposes later on). 3. Distribute Yard Signs. Guess what, this isn't a real political campaign, so it's OK to ask your most loyal customers to put a sign in their yard or offer them free pizza for a favor. What should the sign say? How about something along the lines of, "VOTE for PIZZA!" and include your website address and/or a QR code that links to your pizza campaign page. 4. Plan, Create and Send Direct Mail Pieces. Think of the fun you could have with this. Your pizzeria could have a platform on various pizza issues: "We support placing cheese above the sauce, strive to never burn a pie, and promise not to raise our dough too high." 5. Go door-to-door. Depending on how far you want to take this, imagine the press--and customers--you would get if you and your staff went door-to-door meeting customers and thanking them for their business! It only takes an afternoon or two to cover an entire neighborhood. 6. Hold a Winner Pizza Party! When the "election" is over, and pizza wins, which it always does, invite everyone into the pizzeria for a pizza party to celebrate!